I started the year right with a giveaway from Beginnings Baby. It was overwhelming to know that a lot of those who joined really wanted to win the starter set not only for themselves (moms who are on the way) but also for their wife, their best friend, their sister or sister-in-law. I realized that I wasn’t alone (although this isn’t surprising) in terms of my love for Beginnings Baby. The response of my readers on how they want to win the Beginnings Baby starter kit for reasons that they want to share or give it to their soon to be son or daughter, niece or nephew is enough proof on how focused they are in starting their baby right. I asked those who joined my Beginnings Baby giveaway what set they want for their baby. The variety of answers prompted me to also share my favorite despite it being hard to choose from the checklist as they’ve all been a wonderful part of lil’ Mr. GJGs first few weeks. The Beginnings Baby checklist makes it easier for moms, even dads to shop for their lil’ one. The helpful checklist makes sure that you’ve got the right items, just enough pieces of Beginnings Baby to get you & your lil’ one started. Technically speaking, it is not easy to pick just one from the checklist as all these are important in starting our baby right and helping us care for our lil’ one, especially during the first year of his/her life. But if you ask me, my favorite would be TIE IT UP. Like me, my Beginnings Baby winner is also a believer of the brand. 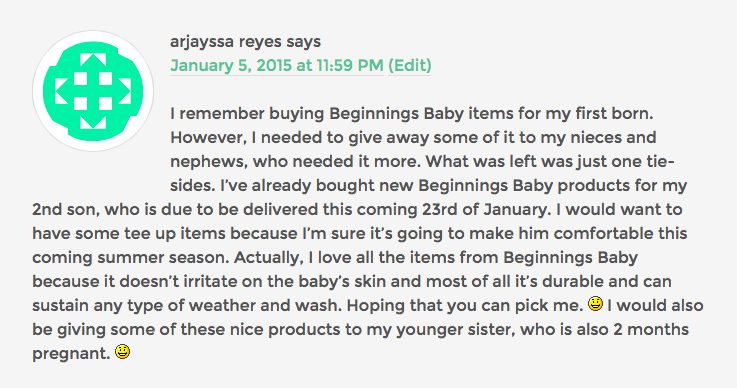 Because caring is sharing, congratulations Jayssa for winning the Beginnings Baby Starter Kit! A lot were asking where Beginnings Baby is available, if you plan on going shopping for it, head over to Landmark Trinoma, any Babyland branches, Metro Market! Martket!, Metro Alabang Town Center, online at Cudsly.com and of course at the SM Grand Baby Fair happening this January 30- February 1, 2015. 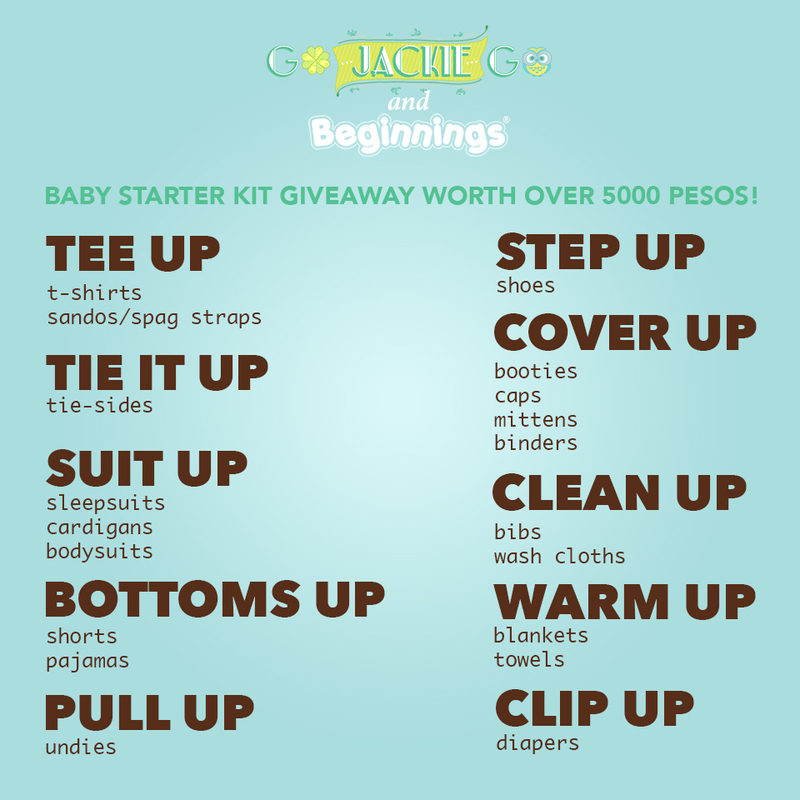 And since so many of you joined the contest and it gained an overwhelmingly great feedback from you all, Beginnings Baby was nice enough to provide us with another starter kit worth over P5,000. You know what this means? Yes, another giveaway! Simply follow the mechanics via Rafflecopter. My baby is already a user of Baby Beginnings. When I was 7months pregnant, I already bought my baby new beginnings undies, cover ups, warm ups and tie ups. I love it because it is cotton made and the quality is also important for me. I want him to be comfortable of what he is wearing. I also love to see him wear all white because aside from it looks neat, you can easily see bugs or ants crawling there and avoid him to be beaten up by insects. Now that he is already 3 months old, I want my child to have tee ups and bottom ups. The tshirt/ sandos and shorts/pajamas will be very useful and perfect for him and also perfect for the weather since summer is coming and it is really hot here in our country. As a first time mom, you would really want everything to be perfect for your baby. I hope to win for him. I love my baby so much. I’m so blessed to have him. He made my life more wonderful and meaningful. I would love to have those cute little tie sides shirts with matching pajamas for my soon to be little girl. I’m sure they would be comfy and would look so neat on her! i would love to have all the products for my baby, my wife just got the doctor”s confirmation that she is pregnant yesterday! my little one is already 4 months old now and eversince his clothes are only hand me downs. he has clothes that could not fit him anymore. thats why i want to give him a brand new clothes with an all time trusted brand of every moms which is beginnings baby. and i would like to give it to him as a gift for his upcoming baptism and i also want to share my blessings to my aunt who is in due this April. thank you. I would love to win the Tee Up set for my baby who is due to join our family in 3 – 5 weeks. After 2 boys, we are now blessed with a baby girl! As excited as I am to immediately start dressing her in all things pink, purple and polka dot, I know that white clothing is the safest, cleanest and coolest for those first delicate months of my baby’s life. I’d love the entire Beginnings Baby line of products but if I were to choose one, the Tee Up set of t-shirts, sandos and spag straps would be a most wonderful and welcomed gift for being so versatile and perfect for the upcoming summer. oops I want to give assorted baby products! i would like to have everything for my baby. since im a first time parent and dad, i would like to give everything that my baby needed and wanted. and this giveaway will help me to do it. for being a great father that i wanted to be for my child. Congratulations Ellaine you won my Beginnings Baby giveaway! 🙂 Please expect an email regarding your prize. 🙂 Thank you for joining! I would love to win the Beginnings Baby Starter Kit for my baby who is due to join our family in 3 – 5 weeks. After 2 boys, we are now blessed with a baby girl! As excited as I am to immediately start dressing her in all things pink, purple and polka dot, I know that white clothing is the safest, cleanest and coolest for those first delicate months of my baby’s life. I’d love the entire Beginnings Baby line of products but if I were to choose one, the Tee Up set of t-shirts, sandos and spag straps would be a most wonderful and welcomed gift for being so versatile and perfect for the upcoming summer. Which of the Beginnings Baby products would you want to have for you child? I like the warm ups for my baby. My wife is in the 6th months now and we had a child last 4 years ago.It’s new for us again,starting all over again because all of our first born clothes was already disposed, we gave it to my sister in law last two years ago because she had her child and since we are not expecting another child we decided to give it to her.We never plan having another baby because my wife has difficulty in bearing a child,she has undergone caesarian section because of fearing having preeclampsia.My wife has hypertension, and don’t want to risk again having a baby because she is afraid of losing it, she had bleeding’s in my eldest in the first trimester of her pregnancy,I salute my wife because despite of her condition she decided to continue this blessings to us which is our second and the last I hope and pray that she will surpass this and I will be her on her side until the end of her journey of pregnancy.I love my wife and my children,by the way we will be having another baby boy my eldest is excited for this. I would love to have those cute and warm pajamas and sandos for my baby boy due on February 22. I’d like to try this brand so I can recommend to my best friend who is also pregnant and will be giving birth by June of this year. It would also be nice if I win and so I can share the things to my best friend and my soon to be inaanak. I haven’t tried the brand but by the looks on the photos, it sure looks comfortable and warm for babies, so please let me win so my son and my best friend’s baby can experience this and we can also pass on to other friends who are planning to have a child soon. Which of the Beginnings Baby products would you want to have for you child?I like to have suits up,I want him to be comfortable whenever he sleeps. I really love babies, love looking at them while they sleep. I have my chance to take care of my two nephews I went to a point that I have to leave my work to help my sister to her son that’s how I am dedicated to them I left my career. My sister is so thankful to me that I have been a great help to her that’s why when it my turns to have my own child she is there to support. All of the baby’s stuff she had she handed it with me because there is “pamahiin” in the province that the first born should not have new clothes for him to prosper in his life. At first I don’t believe in that because that’s my first born and I want him to have the best in the world. But because my nephews clothes are still in good condition I used them instead to avoid arguments with oldies. I noticed that the clothes are still soft and the fact that babies have sensitive skin,and that’s the time I asked my sister what’s her secret,she told me that proper handling of the clothes should be done so that it will not be the cause of rashes and may irritate babies skin. Now that I will be having my second child and I will be starting all over again after 4 years, I excited to shop for my upcoming baby and I am looking for the right clothes, now that I read this I have now an idea what will I buy for him.Yes another baby boy is coming in to the world this April of 2015 and I’m so excited to be a mother again! I want to have “Suit Up”stuff for my baby. Sleepsuits, cardigans and body suits will keep her warm and me as a dad will feel secure knowing that she is comfortable with the fabrics and texture. I want to have the tee up shirts for my inaanak.